A perfect blend is almost a magical thing whether in marriage, music or making really good corn bread. It is also rare enough that most people spend their days on earth searching for some sort of way to blend mind and spirit in order to come up with something fine. As humans, we could do a lot worse with our allotted years. together in the first place and mix so cleverly that the listener has no idea that work was involved. It is the sort of marvel that Sherlock Holmes did with his observations to Dr. Watson, who seeing the same things, could never draw Holmes' conclusions. I listened to masterpieces like "Witchi-Tai-To" with Dr. Watson's own delighted bewilderment. How on earth did they do that to that...and to me? The voices and instruments were so cleverly intermingled so unselfish about trading range and function and pitch that is was like listening to a Persian rug. People never cease to be amazed by Brewer and Shipley who since 1967 have been assembling their careful albums with the same skill fiddle makers use; each one an example of the best work that they had learned to do so far. Like fiddle makers too, they have always surrounded themselves with the best of materials and benefited from the seasoned nature of them. Years playing with and listening to other artists not only made them selective and knowledgeable, but more aware of their unique ability to blend their skills and be themselves. By the time the album Weeds came out in 1969, these two talented craftsmen had become artists in the best sense, with an album that had theme and purpose and better yet, the permanence of Mt. Rushmore in the eyes of their fellow musicians. Weeds was one of those seminal albums that define a time and place, and album of such style and character that it was like visiting the Custer battlefield and hearing the wind in the buffalo grass at evening and watching owls perch on the scattered tombstones. Weeds created a place for your mind to be. No wonder that the next album Tarkio had a ready audience. Brewer and Shipley had captured our imagination. And that of course, is what they wanted to do. A friend of mine once paid them a huge compliment, which I have never passed on until now. He said "The first time I heard 'One Toke Over The Line' I didn't realize how funny it was. I was listening to people singing such close harmony it was like braiding hair". The friend was Hoyt Axton, who knew a hit song when he heard it, having written several. 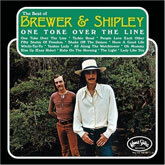 "One Toke Over The Line" became a hit single record, but that was a small measure of the impact of Brewer and Shipley had on people who listened to the sound they had created. Album buyers understood that these men were designers, not pop music freaks, and as prolific as they were, they didn't write songs to any formula. Each album, from Down In L.A. to Heartland, was a meticulously woven tapestry of fabric they had invented one song at a time. This was the stuff of dreams, as music has always been. I have feeling that listening to this album will be a very good place to start for people who have never heard Brewer and Shipley in person. It contains highlights from Weeds and Tarkio and Rural Space and Shake Off The Demon and gives you a sense of not only what they are all about, but a good feeling about what they are still to become. If you are fond of history and facts, and your computer can supply both of these things better than I can and I urge you to visit their website (www.BrewerandShipley.com) and retrace the footsteps of these pioneers. The in-person experience is far more revealing and twice as delightful, at least to me. There is something nearly magical about watching Tom and Mike live, perform the sorcery of blending their separate skills in some kind of alchemy known only to wizards among us, and coming up with a rare form of gold. But that's an old performer talking; a person who likes to see how things are made. I can't help but remember that the first time I heard Brewer and Shipley together was on a record album, and it was a very private joy to listen again and again to what they had done, all by myself in the world of their making. It was a very good way to listen. Now it's your turn. What occurs on this album is what you can expect from two fishermen of time, reviewing their catches. These were the best they could to that day - what with sun and wind and glittering water - to try and capture an elusive creature for you and present it whole and shining. There is no telling what they'll catch tomorrow. In 1968 with the release of our first album "Down In L.A.," I couldn't have guessed that thirty-three years later these yet-to-be-written songs, from four of six more yet-to-be-recorded albums, would be released on this "Best Of Brewer & Shipley" compilation. Time flies...when you don't know what you're doing! Thank you to all the fans and friends who have appreciated our music over the years. Sitting here looking at the song list for this album is, for me, like looking at the chapters of a journal. Each with its own story to tell about life and love on the road. Each with its own set of memories. Some shared with Michael and some that are mine alone. I'm sure Michael's memories are as varied and as rich as mine. Some keep a secret diary or journal to remind them of time gone by. Ours has always been out there to be shared with anyone who would listen. I hope you like our stories. And I hope there are stories yet to tell.